Vane Line Bunkering (sometimes called Vane Brothers) at the foot of Red Hook’s Court Street in the Gowanus Bay, occupies part of the site of the former Ira S. Bushey & Sons facility. The property is owned by Buckeye who also owns and operates the fuel tanks to the west which were also within the footprint of Bushey’s property. 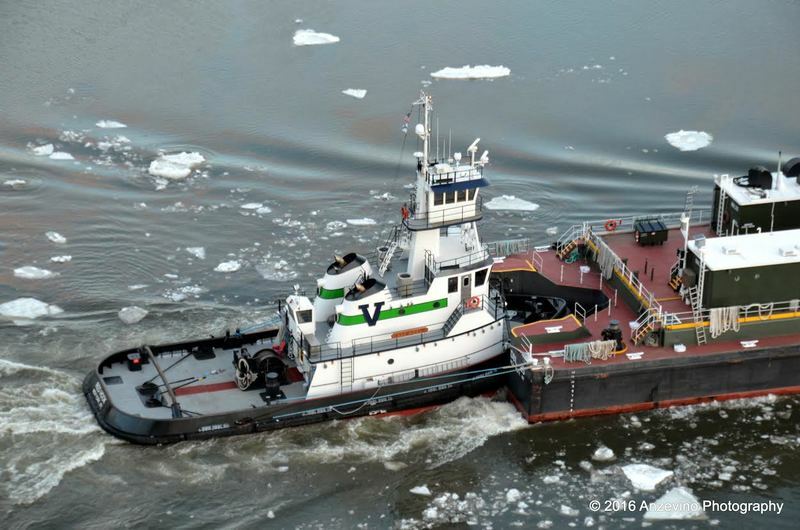 Founded in 1898, Vane is a family-owned marine transportation company that owns and operates tugs and fuel barges. Vane is originally from Baltimore has been expanding in this port and elsewhere. “This port” or “the port of New York” refers to both NY and NJ sides of the harbor. Vane began operations at Court Street in January 2010. Summer 2011, they expanded into rented space at GBX off Columbia Street where they dock empty barges that are waiting (“standing by” in tug lingo) for their next job (aka “orders” from dispatch). Early 2015, Vane expanded further into the Port Authority’s Red Hook Marine Terminal, Pier 8 where more barges stand by. Additionally, Vane has a leased mooring “on the flats” (in shallow water) near the Statue of Liberty on the NJ side of the Bay Ridge anchorage. Vane is the major delivery supplier of bunker fuel (ship fuel) in this harbor. They deliver about 90% of the ship fuel in the harbor. Vane’s NYC fleet has a lot of new equipment. One is the new tug “RED HOOK"
As of June 2016, their new tugs cost at least $8 million dollars, and they have 11 tugs in this harbor and 22 barges, and charter 3 tugs. Vane is working a ratio of 2 barges per tug; because tugs don’t have to stay with the barge. Tugs deliver the barges to where they load or discharge fuel, and can leave the barges during a process that can take hours and then go move another barge. Most of the Vane barges working the harbor have a 30-35,000 barrel capacity. Coastwise barges have 50,000; and a barrel is 42 gallons. Compare this to PortSide NewYork’s home, the tanker MARY A. WHALEN, built in 1938 to carry 8,019 barrels to get some idea how much more fuel we Americans consume. Vane has one “crew boat” a 40-footer for in-house use to zip supplies out to tugs and barges or to move crew members for crew change when the boat can’t come in to the pier or a crew member is late and missed “crew change” for the boat. 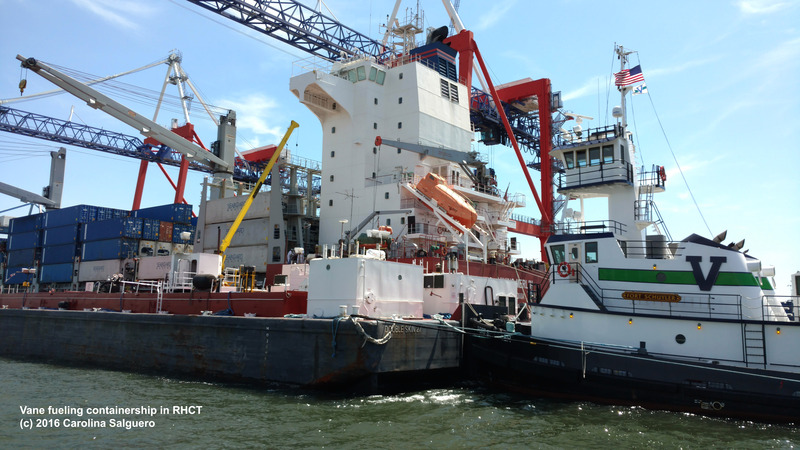 Vane is moving petroleum barges, 50-60% are fueling ships (delivering “bunker” or involved in “bunkering.”) 90% of those load in Bayonne at 3 terminals. They deliver all over the harbor without any primary delivery point since the ships being fueled are in the anchorage (see the nautical chart section of our map) at container port piers in Red Hook, Staten Island, Port Newark, Port Elizabeth and Bayonne as well as at cruise terminal piers in Red Hook, Manhattan and Newark. Some of Vane’s business takes them out of this harbor, up the Hudson River with home heating oil to four or five terminals in Poughkeepsie, Kingston, and Albany. There’s some cross harbor home heating oil movement but not much. They also move gasoline from terminals “down the Kills” (the Kill Van Kull and Arthur Kill) from Bayway, Carteret, Outerbridge, Chelsea One up the Hudson or out the Long Island sound to Connecticut or Port Jefferson. Vane moves some of the product in the Buckeye tanks in Red Hook, but not much. Vane tugs have fivecrew minimum, most are carrying an extra person being trained. Vane barges have a minimum of two crew, and about 50% carry an extra person who is being trained. Vane trains deckhands, engineers and wheelhouse crew. “We bring ‘em in and try to move ‘em up,” says Port Captain John Bowie. Dotcomers did not invent the 24/7 work rhythm; mariners did. Boats work 24/7 with a 24-hour day split into 6-hour ”watches.” NYC tugboat crew work watches of six hours on and six hours off and use the 24 hour clock system. 0600-1200 (6am to noon) is the Captain’s watch when the captain steers and is responsible. When the Captain is off watch and resting, the Mate is on watch. The Engineer and deckhands watches are split so the boat is staffed 24/7. The crews paint the decks and houses of the vessels every summer and do other maintenance. Work can be like the military (hours of boredom broken up by bouts of too much to do in a hurry.) Boats also work in all weather, unless winds, snow or fog are so extreme that safe operation is not possible or harbor ice is so thick that the boats cannot get through without an ice breaker. The “’hitch” is the number of days that the crew work consecutively. Most of Vane’s boat crew are working 2 weeks on, 2 weeks off. Some barge crews work 4 weeks on, 2 off. “Crew change” is the day when all of the boat’s crew is supposed to change. After Sandy, Buckeye’s electric pumps that moved the product from the tanks to the truck rack were flooded and not working. Vane brought over cargo hose and connected hoses to Buckeye’s portable diesel pumps to move the home heating oil so that people could have heat during the deep cold snap that occurred the week following the storm. Tugs, like sports teams, can be identified by their colors (“livery”). Vane vessels have a black hull, white house (the upsticking part where the people are) with a wide, bright green stripe with dark blue stripes either side, and the same blue on railings and visors, and a big V on the smokestack. This Item is related to Item: Bouchard Transportation Co.